Recently, the fundamentals of the "pulsed phase thermography" approach were described . As it is recalled, this approach combines the well-known "pulsed thermography" (PT) and the "modulated thermography" (MT) in which specimens are submitted to periodical excitation. In the present paper, a comparison is made between this new method and the more classical method of Thermal Tomography (TT) based on PT. In pulsed thermography, the thermal evolution of the surface of a specimen submitted to a thermal impact is measured by using an infrared (IR) camera to reveal the presence of defects under the surface . Qualitatively, the principle is as follows: absorption of energy from the thermal pulse causes surface temperature to change rapidly, a thermal front is thus launched under the surface where it propagates by diffusion. The presence of zones having different thermal properties (defects) with respect to that of the bulk material changes the diffusion rate so that defect positions can be seen. Study of transitory heat transfer enables a quantification of thermophysical material properties such as subsurface defects. where Tsoa corresponds to the surface temperature over a sound area (without defects) present in the image. The principles of TT can be understood with figure 1 . In this figure, thermal contrasts under the sample surface are drawn. The time of maximum contrast tc_max is proportional to the square of the depth of the defect. It is possible to calculate the value of tc_max of each pixel. The resulting image is called a timegram TGMc_max. Areas of the specimen having uniform thermal properties will cause the maximum thermal contrast to occur at the same time. On the contrary, an area exhibiting a subsurface defect will reach the maximum thermal contrast at a different time. This is the basis for defect detection. Furthermore, it is known that the occurrence of the maximum contrast tc_max is proportional to the square of the defect depth. This makes available defect position, size and depth. To calculate defect depth, it is necessary to slice the timegram. Each slice gives the location of the pixels which obtained their maximum contrast between t1 and t2. 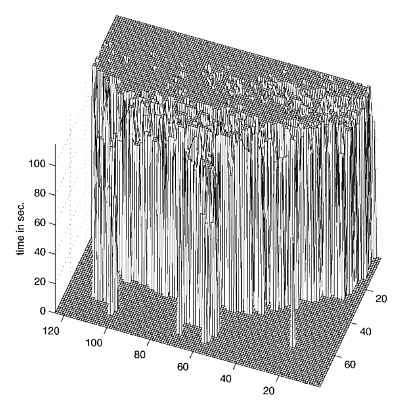 Each slice is called a thermal tomogram, and corresponds to a particular depth layer below the surface. It is possible to compute different types of timegrams (TGM) depending on the parameter of interest. For this paper we are only interested in the time of maximum contrast, tc_max but other parameters like the time of half-rise contrast tc_1/2max, the time of half-decay contrast tc_max1/2 or the time at 3 dB of the maximum contrast tc_3dBmax could also be of interest. Where Cnoise is the thermal contrast noise, tc_k/ z is the variation of the parameter of interest with depth, and C/ t is the time derivative of the thermal contrast curve. Contrary to PT, Modulated infrared thermography (MT) is referred to as locking-thermography . In MT, the specimen is submitted to a sinusoidal temperature modulation and, its stationary response can also be described by a sinusoidal regime whose magnitude and phase depend on the input frequency. Deployment can be done on a point or surface-wide inspection. 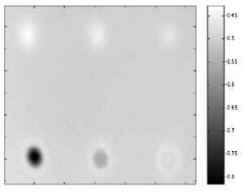 Of great interest here is the phase image which, being related to the propagation time delay, is independent of optical or infrared surface features. As for depth range, it is limited to near-surface features due to the high damping of the thermal waves. However, it can be demonstrated that phase images can probe roughly twice the thickness probed by magnitude or thermographic images. Some potential difficulties concerning MT deployment on plant floor are the controlled application of modulated heating and the slowness of the acquisition process (one must wait for the permanent regime and testing proceeds one frequency at a time). In order to speed up the acquisition process, a frequency transform such as the Fourier transform can be used to unscramble the broad spectrum of thermal wave frequencies obtained in PT experiments. It is thus possible to get similar frequency resolution of MT with the rapid data acquisition of PT. 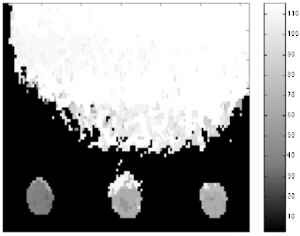 This procedure is called pulsed phase infrared thermography (PPT): the sequence of infrared images from the temperature decay following the initial thermal pulse is obtained as in conventional PT experiments and for each pixel (i,j), the temporal evolution g(t) is extracted from the image sequence (fig 2). Next, the discrete Fourier transform F(f) is computed (f being the frequency variable). For this experiment an academic plastic specimen with six flat bottom holes was used. The specimen was 4 mm thick, and the holes were between 0.5 and 3 mm deep. This simple specimen was selected because the TT can only detect the first subsurface defect. 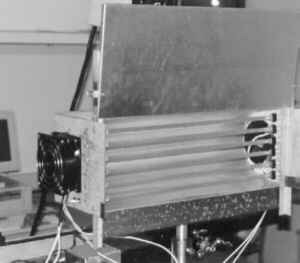 Figure 3 shows the experimental apparatus. It is composed of an IR camera and a series of infrared tube lights for uniform heating of the surface. For both TT and PPT, the lights illuminated the specimen during 3 s in order to obtain enough contrast. In the first case (PPT) the acquisition step is t = 0.5s during 56.5 s. In the second case (TT) 80 images were taken in 116.7s, with an acquisition step which varied exponentially between 0.15 and 5.34 seconds. We are interested in the evolution of the phase for each defect. The most interesting part of the phase variation is at low frequency since most of the energy is concentrated there. Furthermore, higher frequencies exhibit a higher noise level. Figure 4 shows this evolution for different defects. This figure shows that defects are very distinguishable at low frequencies while they are harder to identify at higher frequencies. Figure 5 shows the phase image at 0.035 Hertz. The six defects are easy distinguished. Notice that different phases were obtained for each defect. This information is useful to obtain some information about the depth of the defects . Fig 5: Phase image at 0.035 Hz Fig 6: Position of the defects. Figure 6 is an adaptive threshold made from figure 5 . This image gives us the position of every defect. Here we are interested in the evolution of contrast for every point of each image. The first step is to localize a sound area (defect free) to calculate the evolution of thermal contrast. 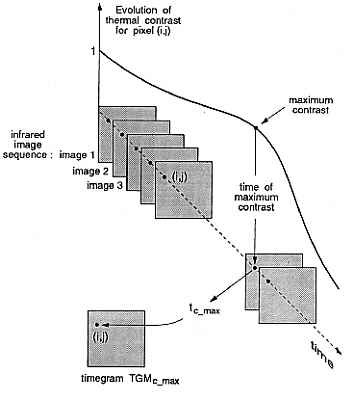 Figure 7 shows the timegram TGMc_max which gives the time in seconds after the start of illumination where the contrast is maximum for each point. Three out of six holes can be seen. These three defects achieved maximum contrast at different times. The remaining three defects are concealed in noise. This indicates that despite even illumination, problems do occur during data analysis. 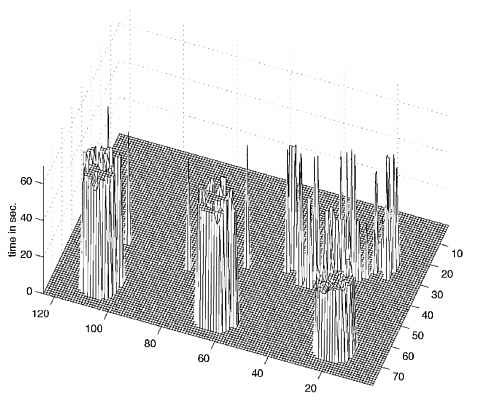 Figures 8 and 9 show the tomograms obtained with the timegram of figure 7. 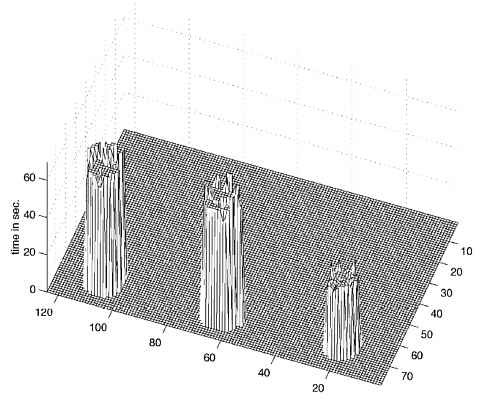 The first tomogram shows the expected deeper holes. But in the second tomogram, the small unevenesses in the illumination prevent identification of the other holes. In order to obtain better results. 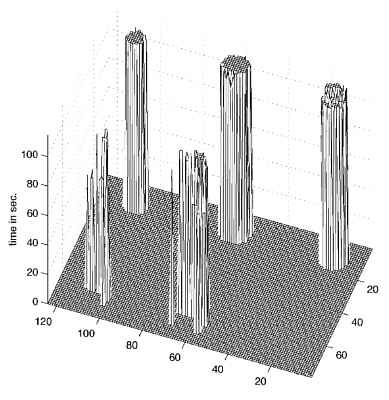 Figure 6, showing the position of defects, can be multiplied with the timegram, resulting in a new denoised timegram. From this new timegram we can extract two new tomograms (figures 10 and 11) which show the six holes and give information about their depth. Each method has some advantage and disadvantages. This method detects position and depth of defects. Each tomogram is equivalent to a slice of the specimen which gives direct information about the depth. It is impossible to observe two defects at the same place. Only the first subsurface defect is visible. 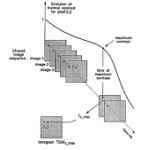 There is a strong reduction of spatial resolution with depth. The phase images are not affected by heating non-uniformity. Thermal sources are thus easier to position. After the FFT, it is very easy to observe the defects. Spatial definition of defects is enhanced. At this time there are only preliminary methods for quantitative defect evaluation. Necessity of fast acquisition rate of infrared images after initial pulse heating to recover exact phase evolution. In this paper we applied the two methods on the same specimen. The results for the TT were much affected by the presence of small non-uniformity of the illumination. But with the information about the place of the defects important information about the depth of the defect can be obtained. The PPT give us some very good results. We obtained easily the information about the presence and the position of the defects. If we consider that PPT is easier to implement and that modern computers dramatically reduce the computation time of fourier transforms we can conclude that this method is far superior to the TT. X. Maldague, S. Marinetti, "Pulsed Phase Infrared Thermography," J. Appl. Phys, 79: 2694-2698, March 1996. X. Maldague Non destructive evaluation of materials by infrared thermography (Springer Verlag, London, 1993). V. Vavilov, X. Maldague, J. Picard, Rl Thomas, LD Favro, "Dynamic thermal tomography: New NDE technique to reconstruct inner solids structure by using multiple IR image processing", Review of progress in quantitative non destructive evaluation, vol 11. Plenum Press, New York, 425-432, 1992. G. Busse, "Nondestructive evaluation of polymer materials," NDT &E Int'l, 27, 253 (1994). 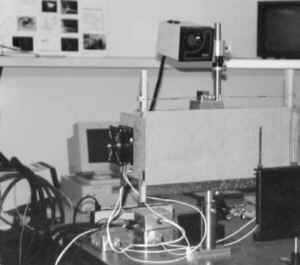 X. Maldague, Y. Largouët, "Depth Study in Pulsed Phase Thermography using Neural Networks: Modelling, Noise, Experiments," submitted to Revue Générale de Thermique, Feb. 1998.